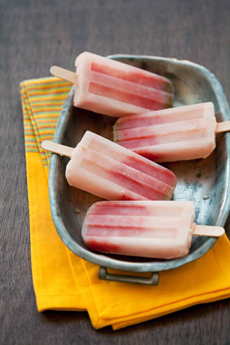 We’ve got watermelon left over from July 4th, so today we’re juicing it and transforming it into ice pops—with tequila, thanks to this recipe from LoveAndOliveOil.com. Here’s the whole story. Check out the site’s many beautiful recipes. For a red, white and blue theme, toss in some blueberries. Frosty, beautiful and spiked with tequila. Photo courtesy Love And Olive Oil. 1. COMBINE water and sugar in a microwave safe container or glass measuring cup. Heat on high for 30 seconds to 1 minute and stir until sugar is dissolved and mixture is clear. Set aside to cool. 2. MAKE the watermelon juice: Roughly chop the watermelon. You’ll need about 3 cups of chopped melon to produce about a cup of juice. Run the melon through a food mill if you have one, or crush and then strain through a fine mesh sieve. 3. COMBINE watermelon juice, sugar syrup, lime juice and zest, and tequila in a small bowl or pitcher. Pour into ice pop molds. Insert sticks and freeze until solid. Ice Pops: Recipes for Fresh and Flavorful Frozen Treats: Recipes include chocolate ice pops swirled with vanilla or layered with raspberries, custard-based cheesecake and caramel pops and green tea with pomegranate. Irresistible Ice Pops: Learn to stripe, swirl, and layer flavors within pops to create new flavor combinations. Perfect Pops: The 50 Best Classic & Cool Treats: Beyond fruit and juice, creative, of-the-moment flavors.